Slice’s newest safety knife is a perfect combination of comfort, precision, and strength. The 10580 Precision Knife is made for industrial use. Workers in fields as diverse as manufacturing, electronics, and medical laboratories enjoy the exceptional tool quality, which enhances their detailed applications. The 10580 Precision Knife’s striking design is as practical as it is novel. The user’s finger slips comfortably into the non-slip ring, which then rests on the knuckle. This design anchors the grip, which is further enhanced by a cross-hatched copper collar. The ring’s angle is adjusted for user comfort – which is good because Slice® ceramic blades last up to 11 times longer than standard metal blades. Should you need to change the blade, the handle’s no-tool blade change mechanism makes it easy, fast, and safe. Simply loosen the collar by unscrewing it, remove the old blade, insert the new one, and tighten the collar once more. “The Precision Knife is designed to work like an extension of your finger, which gives you amazing control over your cuts. We paid attention to details so the handle would fit ergonomically; we added a cross-hatched copper grip and lined the ring with soft rubber. 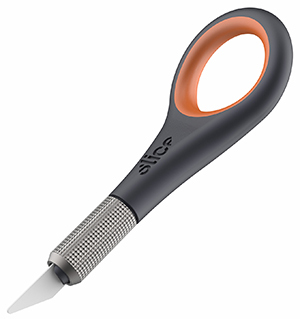 At the same time, the Precision Knife uses our safer finger-friendly craft blades so you cut your materials and not your skin,” says TJ Scimone, Slice founder and CEO. The 10580 Precision Knife ships with a 10518 blade (a straight-edge, rounded-tip blade), and is compatible with our curved-edge, rounded tip blade (the 10520). In 2018, Slice will release a host of new craft blade options—including seam ripper blades, a pointed, straight-edge blade, and a double-edged corner stripping blade—to offer greater versatility. The 10580, the newest addition to our growing line of precision knives is another fresh design that safety-minded professionals will appreciate. Advanced control over intricate cutting combined with the Slice finger-friendly® safety blade means a safer, more efficient workplace for everyone. And, as always, Slice blades are recyclable and do not require a special sharps disposal box. Since 2008, Slice, Inc. has been rethinking safety and design, and sending workers home safe, one facility at a time. This entry was posted in News and tagged Industrial, Tools. Bookmark the permalink.